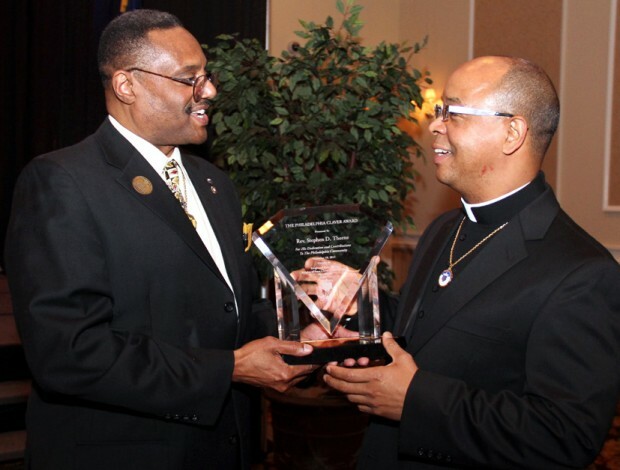 The theme was “It’s a Family Affair: Praising Loving and Living 2012” when about 200 African American Catholics and their friends gathered joyfully for the Sixth Annual Philadelphia Peter Claver Award Banquet held Nov. 18th at the Drexelbrook in Drexel Hill. Sponsoring the gala were the Knights of Peter Claver and the Knights of Peter Claver Ladies Auxiliary, and the principal honoree was Father Stephen Thorne, pastor of St. Martin de Porres Parish, Philadelphia. The Knights were founded in 1909 in Mobile, Alabama, and were introduced to Philadelphia at the former Most Precious Blood Parish in 1976. Today there are 12 councils and courts (ladies auxiliary) in Philadelphia, Camden and Wilmington, which come under the Philadelphia Central Committee. “I’ve been in the Knights since 1999, I’m a member of St. Athanasius Council,” said Leonard Brooks, the President of the Philadelphia Central Committee. He noted at a recent induction ceremony that Archbishop Charles Chaput and Auxiliary Bishop John McIntyre joined their ranks. In addition to the Peter Claver Award given to Father Thorne, Body of Christ Community Service Awards were presented to St. Joseph Sister Catherine Bones of St. Athanasius Parish, Elise Cannon of St. Ignatius Parish, James DeMoe of St. Barbara Parish, Jennifer Simmons of Our Mother of Sorrows Parish and Sister of Mercy Mary Scullion, cofounder of Project H.O.M.E. Chaplains Awards, which are given to youths, were presented to Carmen Harris, Tyler Martin, Zipporah Ridley, Alvin Chiverton and Badiyah Parker, who was the subject of a Phaith magazine profile that may be read here.